Darkfield microscopy creates a hollow cone of light that surrounds the specimen and creates somewhat of a back-lit image. When preparing slides for darkfield microscope use, there are several considerations that can help produce higher quality images. 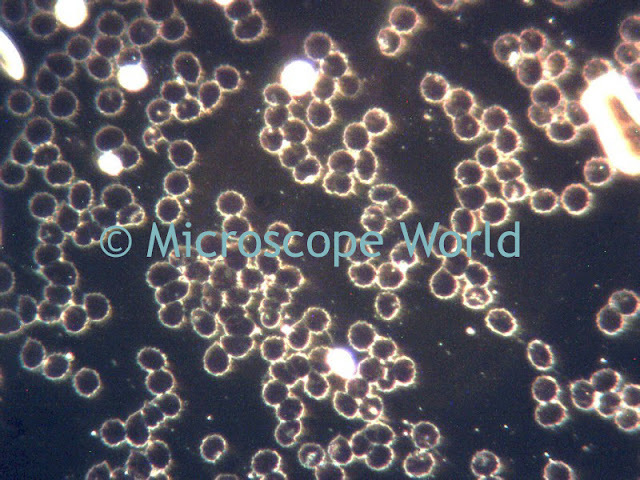 Blood cells captured using darkfield microscopy. If using higher magnifications for darkfield microscopy, the mountant or medium must not be too thick or concentrated. If the medium is too thick the required detail will be lost in the general glare and brightened background. The maximum allowable thickness for suspension of particles or organisms is about 10 microns. Microscope slides and cover slips must be very clean and free from scratches. There should not be any air bubbles in the immersion medium. Air bubbles will show up in the darkfield and decrease the contrast. When very critical work is being performed under the microscope, the effect of darkfield condensers can be enhanced by using microscope slides and cover slips that are made of quartz. Glass shows some fluorescence under the normally necessary intense illumination which decreases the background contrast. Quartz better withstands the drastic cleaning methods necessary for critical work.